Greenville After eighteen months in office there are many of us who wondered if America was ever going to finally draw a line that told President Trump that he had gone too far. Was there going to finally be a point where America forced President Trump to look past his own nose and self-interest and learn something about fundamental national values? Was he finally going to have to learn that hard problems require hard work to solve rather than boasting and bullying, fussing and fuming? Well, we may not like the answer to these questions, but we seem to have found them in his total capitulation over the issue of family separation and child incarceration of immigrants on the border. The heartbreak and trauma of families being torn apart and children weeping created a firewall that stopped Trump and his heavy breathers from Attorney General Session on down to the rest of the gang. We all need to take note and remember this lesson, just as Trump is being forced to do. It could be important on many other issues around health and housing for example. The Trump beatdown was total. After weeks of claiming an executive order wouldn’t solve this crisis, even though his orders had initiated the crisis, he issued an executive order. After weeks of falsely blaming the Democrats and saying only Congress could take action, he had to eat his words. backdown and face reality. He and his people were swamped by a tsunami of popular, institutional, corporate, and political opposition. Members of his own party rebelled. Evangelicals and other religious denominations from the Pope down to the storefront churches rebelled, hurling back the hundreds of Bible verses protecting families to the few that Sessions and the head of ICE used to defend Cesar’s renderings in law. Houston said it didn’t want a children’s detention center built in its city. New York State said it didn’t want separated children sent to the state. All four living first ladies condemned the policy. There was conflict within the Fox family over its slanted news on the border. Microsoft workers protested contracts with ICE. The United Nations correctly claimed Trump’s actions were a human rights violation. Mr. Trump meet America drawing a line. Is this over? Can anyone claim victory? No, not yet. No one in the administration knows the status of reunifying the 2300 children now in custody, and some in the administration are trying to argue they will be kept in detention, which will increase the political heat. The federal judge’s order limits children being held to a maximum of twenty days, while Trump’s order wants to hold families in detention indefinitely. Few believe the judge will budge. No one has a clue where or how families will be detained. There is seemingly no consensus in Congress. 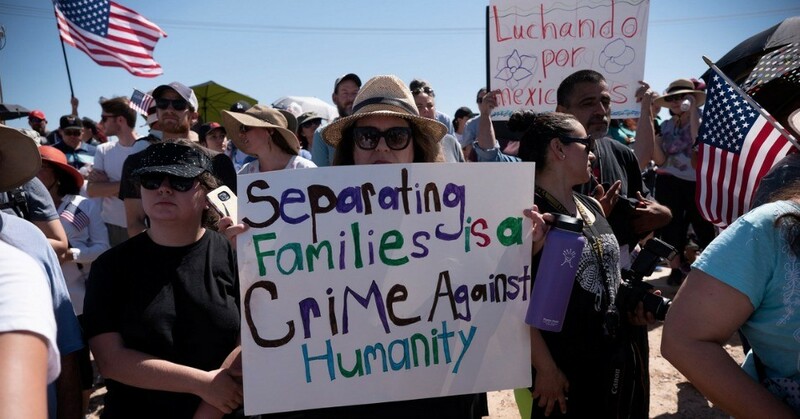 A Senate bill would end family separation, while there are competing bills in the House that both lack the votes to pass. This is a hot potato that no one wants to touch, and the fight – and damage to Trump and his party – is going to continue until there are real solutions, none of which seem to be anywhere near the hardline policy the president and his people want. America may be teaching Trump exactly what a hard line really is, and we’re drawing it now. This entry was posted in immigration reform and tagged borders, immigration rights, migrants, Trump Adminstration by Wade. Bookmark the permalink.